I love this color combination! I wish I had Basic Grey by Stampin' Up! but I didn't so I used Basic Black instead. Although last night I did place a order for the basic grey ink pad, and paper! Can't wait to get it. This was a color challenge over at SCS. I used the Paisley cuttlebug folder on basic black. I used the stamp set Women of Life by Papertrey ink using black Stazon ink. I really don't like the way the picture makes the ink look like I didn't stamp it clearly because it did. Not sure why it looks kinda blotchy. 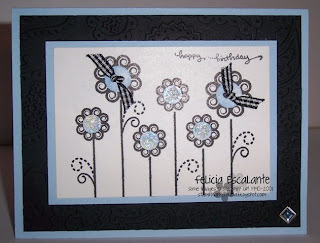 I then stamped the middle of the flower in bashful blue and used stickles for the middle of 4 flower buds. I wanted to put ribbon but didn't know where to put it so I tied little bows in the bigger two flower buds with the black gingham ribbon. I matted that image on bashful blue cardstock. To give it one last element I put a bashful blue square rhinestone in the bottom right hand corner.